The Shanks are Kansas City’s HOTTEST cover band, playing classics from Led Zeppelin all the way through today’s hits! Come and check out their next show! The Shanks are the rock ‘n’ roll apocalypse of songwriter/vocalist/bassist Ian Donald Starkey (St. Pistolwhip von Shankenstein), partnered with drummer John David Brumell (Colonel Crankshaft). The two have been creating gritty alternative punk rock together since 2010. Although Starkey originally started the band in 2005, with the release of the EP “Here Come The Shanks” (self-released). Ten years later, with the release of “X” ep in October 2015. Starkey sets up Here to Everywhere Entertainment Inc. as the new label and publishing home of The Shanks. After comparing with the likes of Alice Cooper and The Dead Boys, it’s no wonder that the duo were nominated for Album of the Year in 2014 by Exclaim! Magazine for their fourth album, “Surfing the Lexicon”, produced by Sir Ian Blurton and released in the US via Phratry Records. Their upcoming fifth full-length album (there have been several EPs along the way as well as a compilation album), titled “Prisons of Ecstasy”, was produced by Nicke Andersson (Entombed, Hellacopters, Imperial State Electric) and is due for a September 2016 release. 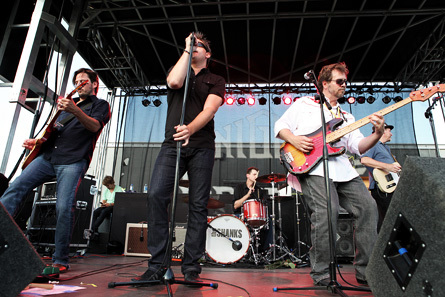 The Shanks have undertaken several tours in the US as well as Europe. Showcasing at Reeperbahn Festival in Hamburg in 2014. Where they secured distribution via Broken Silence Germany; with their most recent US tour taking place in the Fall / Winter of 2015, supporting UK’s legendary post-punk icons The Membranes. The Shanks look forward to hitting the road again in Canada, the US, and Europe, promoting the new album.